The IoT (Internet of Things) is a modern-day buzzword with lofty expectations to have a profound impact on society. But what is it, how will we use it and what will that impact be? Is it exciting or will it be frightening? Will it be helpful? Who will be the winners and who will be the losers? These are important questions, especially when you consider that IoT may have as great an impact on society as computers and the Internet have had. Maybe even more. The Internet of Things is Not of Things! Let’s start with the name itself, since it can be a bit confusing. “Internet of Things” was originally used as a differentiator to the “Internet” as we know it today, sometimes also called the Internet of People. But because the Internet of Things is using the same network as the Internet of People, some companies preferred to use the phrase “Internet of Everything (IoE),” which is probably a more accurate description. But that name never caught on, possibly because “Everything” is just not specific enough. It has become clear over the last few years that “Internet of Things” isn’t quite accurate – and may even be misleading. Probably the best way to describe the Internet of Things is as an application or as a service that uses information collected from sensors (the “things”), analyzes the data, and then does something with it (e.g., via actuators – more “things”). The service, for instance, could be an electronic lifestyle coach, collecting data via a wristband, analyzing this data (trends) and coaching the wearer to live a healthier life. Or it can be an electronic security guard that analyzes data from motion sensors or cameras, and creates alerts. Or a butler, who turns off the lights and the heater or air-conditioning when a room is not used. Maybe Internet of Services would closer describe the IoT value. But whatever its best name may be, the IoT is typically a set of “things” connected via the cloud (Internet) to a server that stores and analyzes data (trends, alerts, etc.) and then communicates with a user via an application running on a computer, tablet or a smartphone. So, it’s not the “things connected to the internet” that create value. Rather, it’s the collecting, sending and/or receiving data from the Internet that creates value. It’s the data analytics; not the things themselves. The IoT Actually Predates the Internet! When considered from this perspective – as a service that gathers, analyzes and transmits data – the IoT has been in existence for years or even decades. For example, in the early days of wireless telephones (long before the term IoT started floating around), vending machines “called” a dispatch center when running out of a product, transmitting full inventory information at the same moment. The dispatcher then sent a refill order for that machine. Entirely more efficient than some guy in a truck just driving around to every hotel or office building and manually checking each vending machine. Another “old” IoT application would be the ordinary home or building security system, with a set of motion sensors, wired to a patch panel, and from there connected to a phone line and an alarm service center. If the house is armed and a sensor is triggered, the alarm service center calls the house, the neighbors or the police. Note that this pure IoT application (in the sense of Internet of Services) is also fully wired. The IoT does not need to be wireless. This particular IoT application existed before the Internet, making ADT Security Services one of the older IoT companies existing today. So then why has such an old concept like IoT been the center of so much hype in recent years? A cynic might attribute this to technology companies needing “something new” when the first signs emerged of a saturating smartphone market. But the reality is that a few fundamental things changed, creating momentum for new emerging applications that found a home under the umbrella of IoT – from Fitbits to thermostats, smart street lights to smart parking. The first fundamental change was that the Internet became nearly ubiquitous. 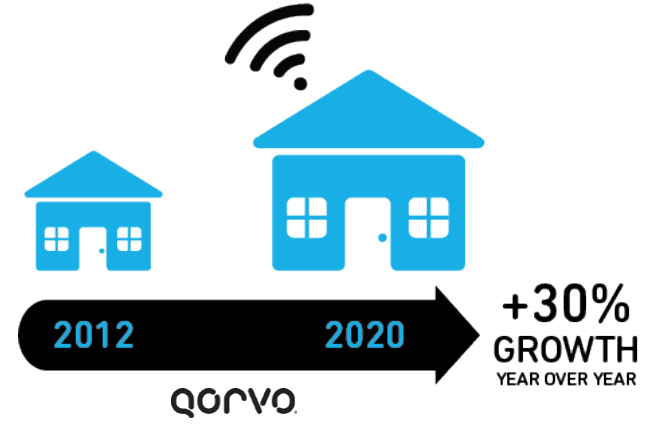 Initially connecting computers, the Internet now connects homes and buildings. And with the advent of wireless technology (Wi-Fi, LTE), access to the Internet changed from a technology into a commodity – and, for some people, a number one ranking on Maslow's hierarchy of needs. The second fundamental change was essentially Moore’s Law rolling along, with smaller, more powerful and lower cost devices being developed to collect data. And finally, low-power communication technologies were developed that extended the battery life for these devices from days into years, connecting them permanently and maintenance-free to the Internet. Unfortunately, the original “connecting computers to the Internet” paradigm has put many companies on the wrong foot. In the way computers, laptops, tablets, smartphones connected the Internet, the illusion was that “connecting sentrollers (sensors/actuators/controllers) to the Internet” would create a similar momentum. The illusion and the misnomers of the IoT was born: sensors are not independent platforms, like computers or phones. What is Holding the IoT Back Today? As with many technologies, after a few years of high expectations, the IoT is slowly entering the Valley of Disillusionment, that quiet phase where sobering reality starts kicking-in. Usually this is also the period where the fads and the wild ideas separate from the strong and more realistic groundswell of useful applications. The good news is that when we compare this to other technologies, we seem to have short memories of the “not quite right yet” years, when early adopters worked to help the technology through to success. The same will happen with the IoT. The IoT is suffering today from a lack of understanding of its true value proposition; and at the same time, a plethora of proprietary and open communication standards inhibit interconnectivity, create confusion with consumers, and confusion among product builders themselves, keeping product prices high and delaying market growth. On top of all that, large companies seem determined to seek the holy grail (and promote their own ecosystems). And that, really, is the crux of the IoT illusion. “Things” sounds so simple. But the IoT is more complex than we anticipated. More complex, but also more promising. It is not a single application, or a handful of applications. It is a fundamental technology that will influence all the facets of our lives. And it will be unstoppable, because it just makes sense. What is the Core Value of the IoT? How does it make sense? Well, do you ever wonder where economic growth comes from? We live in a wonderfully interesting time, when amazing things happen. Consider that in the year 1820, 90% of the population lived in abject poverty, today, some 200 years later, that percentage has shrunk to under 10%, despite that the population itself has multiplied several times. It is the miracle of the industrial revolution and many other things coming together. After World War II and the invention of the transistor, the industrial revolution seamlessly folded into the technology revolution, and we went from computers to smartphones, and from the internet to the IoT. But how does this economic growth drive out poverty, and what keeps the momentum of economic growth going? It’s all about “making better decisions faster.” The industrial revolution was based on innovation and creativity, individual freedom and organization. Consider that the Hoover Dam, one of the wonders of the twentieth century, was designed with slide rulers, paper and pencils. Three decades later, we managed to get men on the moon using computers that had a fraction of the power of our smartphones. And making better decisions faster is driving the IoT into existence, too. It will make our personal lives more comfortable, more safe and secure. We will waste less energy. The IoT will make the quality of our products better. Factories will be more efficient with raw materials and other resources. We will be able to better monitor our environment, and our impact on it. The IoT is not a break from the past, it is a natural progression in making better decisions faster, and a continuing engine for our economic growth and wealth creation – driving out poverty altogether. As we stay for a while in this sobering Valley of Disillusionment, we must not forget to recognize the core value of the IoT. Less mistakes, less waste, a healthier lifestyle, no more poverty. We have come a long way; we still have a long way to go. There is much more to achieve this century, and the IoT will be pivotal in those achievements. How does “making better decisions faster” apply to self-driving cars? These are, by the way, part of the IoT. Essentially a car is a thing, and connecting the car to the Internet, equipping the car with sensors, and allowing it to drive autonomously, using the engine and the steering wheel as actuators – this all fits IoT. Or, if you prefer the Internet of Services: everyone has his own driver, so please take a seat and enjoy the ride! Interestingly, self-driving cars have the inherent capability to become safer drivers than humans. This is not so different than self-flying planes being safer than planes flown by pilots. The marketing message of self-driving cars is not clear yet, however. Is the benefit to be able to pay attention to things other than driving, like reading the newspaper or emails? Or is it because it will safer? However this plays out, self-driving cars are an example of the IoT and how it will make our lives safer and more comfortable. Remember that one of the opening questions about the IoT was about winners and losers? There will surely be both. The industrial revolution and the subsequent invention of assembly line production came with its share of winners and losers. There was major upheaval and social unrest as we came to grips with all the changes. Last century brought two World Wars, and suffering seemed unconstrained. Even the most heinous war crimes of that century were executed with industrial capabilities. The technology revolution also contributed to upheaval and unrest. People were replaced by computers and lost their jobs. “How does it feel to be replaced by a machine?” We’ve been asking this question for 40+ years and will continue asking it as the next wave of technology and robots takes over ever more complex jobs. To date, despite considerable pessimism about the loss of jobs to automation, overall employment has not appeared to decrease. Clearly, change has been very painful for those impacted. But overall, where jobs were lost, other jobs were created. And by economic law, jobs with low value-add disappeared and were replaced with jobs with high value-add – the “cleaning mechanism” through which economic growth and wealth creation was affected. Will the IoT be any better? I am afraid not. Making better decisions faster will create change and upheaval. It will redefine jobs and skills. It may even create unrest. There will be winners and losers. There will be people who will see opportunities. And there will be people who will fall victim because “better and faster” is not what they can absorb. In this sense the IoT will be just the next example of the tradition of the industrial revolution – that more prosperity comes at a price. The IoT will affect the overall job market, and our lives, to a similar degree as felt in the industrial revolution, during the rise of assembly line production, and in the first waves of the technology revolution. The IoT’s network of connected devices will absorb many of the repetitive, drudge work tasks of today. And in much the same way as the post-industrial revolution period, while machines are doing the grunt work, humans will have more time to spend on solving bigger problems. Will the next level of post-industrial society and the increased valuation of knowledge that accompanies it enable the next level of creative culture? A new generation of space explorers? A new enlightenment, perhaps? The IoT may even have a darker side, about which serious discussions are ongoing, because an essential part of the IoT is data analytics and “artificial intelligence,” with the sensors as the eyes and the ears of the IoT. Artificial intelligence can start taking action via actuators and controllers, and suddenly we are in the middle of a nightmarish science fiction movie where machines have taken over control of the world and our lives. Can the IoT become a monster that will turn against us? Returning to the self-driving cars is an interesting example of dilemmas we will face in the IoT. Imagine a scenario in which a self-driving car gets into a traffic situation where the choice is to either crash into a pedestrian or avoid hitting that person by changing course and crashing into another pedestrian. For that sake, it needs to choose between crashing into a pedestrian or crashing into a tree killing the passenger. This is a hypothetical situation, clearly: the first assumption is that a self-driving car is driving safer than a human driver, and therefore, overall self-driving cars will have less accidents, making overall traffic safer, simply because in general, they make better decisions faster. Therefore, this example is essentially a variant on the question “will the IoT turn against us?”. Probably the simplest answer to this question is “no.” It is as secure as the Internet, which is to say, not entirely secure. It is as secure as driving a car or flying a plane, which is to say, not entirely secure. Consider thinking of IoT security risks in the same way that a window in your house is a security risk. If you want to make your house safer, you could start by eliminating all the windows. The question of IoT privacy follows the same trail as the IoT security. The IoT is as private as the Internet, which is to say, not entirely private. And again, it may be more useful to consider the tradeoff between the need for privacy versus the benefits of the Internet and IoT. It is clear, that different people have different needs for privacy. There are people who safeguard their online information, and other people who “spill their guts” via social media and other applications. And then there are larger issues related to technology and privacy, like Google Maps driving by your house. There is also the rather interesting ignorance about privacy when it comes to the growing number of devices that people have at home or carry with them. Devices like phones, tablets and TVs with cameras and microphones that can hear and see everyone in the room, unnoticeably. We even buy microphones to place in the living room or on the kitchen counter. (Hey, Alexa!) And we think that Alexa is not listening the rest of the time. Right? So privacy is clearly a tradeoff between the benefit of the application versus the impact of giving up some level of privacy. The key thing here is making an informed decision about this tradeoff, but unfortunately, product makers are not always transparent on this issue. This also means that privacy and privacy protection is becoming more of a legislative/enforcement issue than a technology issue. Under what circumstances can information be collected, how and where will it be stored, and how will it be used? What are the penalties for infringement? What are the requirements for safeguarding collected private information, and what are the penalties for failing to do so? While there is significant legislation in development, it needs to be understood that this development is taking place after the train has left the station. In the modern Internet world, integrity becoming a real issue with the arrival of “fake news,” and bots generating tweets and posts that are interpreted as real news. If the IoT is starting to help us to make decisions, it should be no surprise that integrity is becoming a real subject of attention, along with security and privacy. Let’s give this a closer look, remembering that the core of the IoT is a set of sentrollers that support decision making or enable autonomous decision making. Using an alarm system example, there are four situations (or “states”). Integrity is about the chances of a false alarm or of a system failure. False alarms are annoying and can disturb your sleep, but they are manageable. A system failing to detect an emergency is a more serious problem, because system failures damage or destroy our trust in the system. The reliability of such systems is clearly critical, and when they fail, their robustness is taken more seriously. When sensors themselves are the weakest point in the system, they get doubled or tripled so that failure of one sensor does not result in total system failure. (The reason sensors are often tripled is that if two sensors give contradictory information to a computer, the third sensor is the tiebreaker.) This is just one example of the inherent need for integrity with autonomous systems and artificial intelligence. There are many more and they are only becoming more prevalent. So where are we with the IoT? Hopefully a few things are clear. The IoT is more than a smart meter or the like. It is a complete new wave of automation that includes everything from omni-sensing to artificial intelligence, from smartphones to smart homes, and from smart industries to smart cities. It is all about being better informed, about being able to make faster and better-qualified decisions. It is about safety, security, privacy and integrity. It is also about losing certain jobs and finding new ones. It is about economic growth and wealth creation based on better decision making. Even if we are currently in the Valley of Disillusionment, we should not be distracted. We still have a lot to learn (maybe less technology and more business models on maximizing the value-add), but we are in the middle of shaping a better world for the next generation. A world with less poverty, hopefully fewer wars. Maybe a new Golden Age, an Enlighted world? We will see, because we can!